Topics: Hirsch Electronics Scramble Pad, Security Videos, Training Facility--springfield, and Il. It has 2 DNS records, ns2.yourhostingaccount.com, and ns1.yourhostingaccount.com. 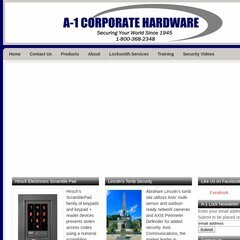 A-1lock.com's server IP number is 38.113.1.225. It is hosted by Ionet Inc (District Of Columbia, Washington,) using Nginx web server.